SDFF Review: Takeshi Kitano's "Outrage" is a flawed but intriguing "ballet of violence"
I really didn't come up with that headline: the Denver Film Society employee who eagerly introduced the film used the term "ballet of violence" in describing the movie, and since that's a better headline than anything I could ever come up with, I ran with it. It was quite a good introduction, actually, to a film that, while flawed, was worth the midnight trip to the Denver Film Center. Now if you'll excuse me, I'm going to go to bed, as I have another two films to review tomorrow and it is currently 3:40 in the morning. I leave you with my review of Takeshi Kitano's Yazuka gangster flick "Outrage," which, if you are intrigued, can currently be found through Video-on-Demand services. Review after the jump - enjoy! 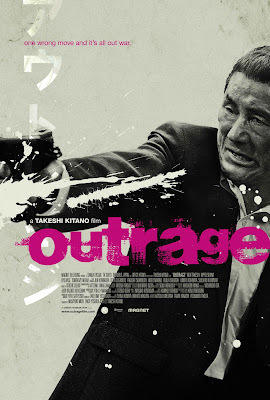 When the schedule for the Starz Denver Film Festival was released this year, one of the films I immediately knew I had to see was “Outrage,” the latest film by acclaimed Japanese director/writer/star Takeshi Kitano. I’ve been interested in Kitano’s work ever since I saw him in Kinji Fukasaku’s “Battle Royale,” one of the best movies of the early 2000s. Kitano is utterly fantastic in that film, and I was intrigued when I learned that he’s most famous, internationally at least, as a filmmaker, not just an actor. He’s worked in multiple genres, but Kitano is best known for writing, directing, and starring in a number of Yakuza (Japanese organized crime) gangster dramas. Up to now, I’d never seen any of his movies – mostly because I’m lazy and didn’t want to track down DVDs – but I’ve always wanted to, and “Outrage,” his return to the Yakuza genre after some time away, seemed like the perfect place to start. It’s a flawed film, but a fascinating and entertaining one, and it has definitely encouraged me to track down Kitano’s prior works. “Outrage” is a sprawling crime epic focusing on a vast crime syndicate, the Sannokai. This organization is comprised of multiple Yakuza families: at the head of everything is the Chairman, who benevolently oversees the actions of his immense network of underlings. Three key families work for the Chairman: Ikemoto, Murase, and below them, Otomo. At the beginning of the story, orders come down from the chairman that the Murase family must be brought into line. A series of killings between the Murase, Ikemoto, and Otomo sparks a violent conflict between the families, where alliances are made, altered, broken, and re-made on a constant, fast-paced basis. There are a huge number of characters at the heart of this conflict, each with their own divergent motivations and plans, and things get very complicated very fast. To Kitano’s credit, though, things never become confusing. He has created a fairly startling number of characters working within a fluid and complex organization, but he handles the huge amount of exposition deftly. Kitano shows us how Yakuza operations work, through conversations and through actions, and we learn via immersion. As someone unfamiliar with the Yakuza, I picked up on all the multifaceted intricacies fairly quick, and though it took a little longer to work out all the characters, matching names to faces to families and so forth, the effort was constantly rewarded. The plot is thick, but it’s also fascinating. “Outrage” bears some similarities to the gangster flicks we are familiar with in the West – lots of murder, bribery, despicable main characters, etc. – but it examines the criminal hierarchy in a very different way. Kitano is primarily interested in the moments between major acts of violence, all the discussion and planning and politics that go into running and maintaining a crime syndicate. Though all three families are supposed to work together, they each have their own interests in mind, so every decision they make must be perfectly calculated. Thus, most of “Outrage” is dialogue, scenes set in rooms full of criminals as they discuss their options. There’s plenty of violence and mayhem, but they come merely as methodical pieces of the puzzle, moments where plans laid out or hinted at in dialogue come to fruition. Kitano’s attention to detail in illustrating this conflict is impressively exhaustive, stimulating the mind more than any other sense. This thoroughly fascinating look at how the Yakuza operates is both the film’s greatest strength and its core weakness. The plotting is so intricate and layered that the movie quickly becomes mechanical and detached; events are discussed and executed with little pomp and circumstance, and Kitano’s storytelling gets more and more ruthlessly efficient as the film moves along. Kitano hasn’t created characters so much as he’s placed a lot of pieces on a chess-board, and rather than develop the characters, he simply moves them around with a cold dispassion. The film is very well acted, but few of the characters pop off the screen in an engaging way. As such, much of the film feels distant, too far removed from the audience to make a real impact. Certain scenes work fantastically on all fronts, however, particularly those moments involving violence. Kitano’s attitude towards bloodshed is wonderfully unique; he builds tension terrifically, but he also injects each bit of violence with a dark sense of humor. In an early scene, the Otomo family convinces a rival to cut off his own finger as a sign of respect, but instead of playing up the disturbing aspect of the concept, Kitano’s character mocks the rival about the self-mutilation, acting as though it is a perfectly common, reasonable request. Which, in the Yakuza, probably isn’t that far from the truth, but the down-to-Earth way Kitano stages the scene highlights the humor in the situation, even as the concept (and, ultimately, imagery) makes us squirm. That’s only one highlight: there’s a sequence in a restaurant that it both fantastically gory and a minor comedic masterpiece, and the film’s most discussed (and disturbing) scene, involving a dentist drill, is punctuated by an extremely humorous beat. Kitano has clearly mastered this unorthodox tone, and therefore manages to express a lot about the casually destructive nature of violence in the Yakuza. As I said above, few of the characters really jump off the screen, but the entire cast is solid, and as a director, Kitano clearly has a strong handle on the ensemble. He himself steals the show as Otomo-san, a veteran Yakuza who has spent most of his career playing second fiddle to men who simply aren’t as talented or capable as he is. Kitano illustrates this inner conflict wonderfully; in one scene, he’ll effortlessly display the calm, tactical genius of the character, while in the next, he’ll play Otomo-san as the respectful subordinate. Otomo­-san has been around long enough to know what it takes to survive, and that makes him a very interesting character. He appears fairly sporadically in the film, all things considered, and says very little; Kitano instead uses facial expressions, mostly based around the world’s most expressive eye-twitch, but he leaves a huge impression whenever he’s on-screen, so much so that when the character is largely wasted during the third act, it’s a huge disappointment. A few other key cast members stand out as well: Kippei Shiina is very good as Mizuno, Otomo-san’s young right-hand man, lending the character a distinctive attitude that mixes hotheadedness with extreme capability. Jun Kunemara is hugely entertaining to watch as the double-crossing, manipulative Ikemoto-san, who has the best comeuppance in a film full of entertaining retribution. Finally, Soichiro Kitamura is extremely convincing as the Chairman, effectively displaying the kind of cool, firm leadership the character would need to thrive in his job. From a technical standpoint, “Outrage” is a marvel. Kitano uses every last inch of his wide, CinemaScope real-estate to great effect, even staging one kill so that it takes place across the whole frame, the subject moving right-to-left as the camera stays still in one gloriously unsettling long shot. Keiichi Suzuki’s music probably wouldn’t be anything special on its own, but it’s surprisingly effective in the film, used sparingly but always to great effect. “Outrage” is far too mechanical and detached to leave a lasting impact, but it certainly has a lot going for it, and seeing it on the huge screen at the Denver Film Center was quite a treat. When all is said and done, it kept me awake, alert, and interested from midnight to two in the morning on a day when I woke up at seven, and that has to count for something. I can’t speak to where this one stands in Kitano’s personal canon, but as an introduction to his work and to the Yakuza genre, it definitely got me intrigued. While this is yet another film I’d say you have to see on the big screen, I don’t think US distributor Magnet Films has any plans for a theatrical release; it is, however, available through Video-on-Demand services, and if this sounds like your kind of movie, I’d recommend giving it a shot.